Last Friday I got a message from a man named Ibrahim Tommy, who said he loved reading my columns in Awoko (I was glad to hear at least one person in the country reads them!) and he wanted to arrange for me to cover a donation ceremony at an orphanage for children whose parents died during the Ebola crisis. He was donating to celebrate his daughter’s 10th birthday. I was excited for the opportunity to do the story, as horribly selfish as that sounds in the context. (Jon Ronson was definitely right when he wrote that journalism is sociopathic). The man arranged for someone to drive me from my hostel to the orphanage, which is about ten miles outside of Freetown. On Saturday morning, we proceeded up the steep hills that tower above Freetown, passing a waterfall and near the top, several graffiti tags saying “Gaza Gang” spray painted on the small sections of fencing on the edge of the drop. I’d gone a similar way the day before when I visited the Tacugama Chimpanzee Sanctuary (a blog post about that is coming soon). We drove out into the countryside, dominated by greenery, hills and buildings that were either simple shacks, large gated compounds or still unfinished. My driver asked around a few times to find the right place. At once point we drove through what seemed like the market street of a small village, with stalls on either side of the road. I still find it amazing how quickly Sierra Leone becomes rural outside of Freetown. We eventually parked at the orphanage, a yellow building with a low tin roof. On the porch of the orphanage building, the donated items were stacked. There were 20 bags of rice that said “Product of Pakistan” on them, along with sardines, rice, and something else I couldn’t identify. A tiny kitten was slowly climbing among the sacks. I was there pretty early, though I didn’t realize it, as I wasn’t sure there would be a formal ceremony. This was fortunate, because I got to interview people: a politician and another community figure, and Margaret Tucker, a woman in her 50s or 60s who lost her husband in the civil war and now acts as caretaker of the orphanage. After her interview, Margaret asked the children who among them wanted to be interviewed. The only one brave enough, (or in the mood) was a guy in his late teens or early 20s who said he had arrived as an orphan of the civil war and had lived there for 15 years. I hadn’t had any expectations for what it would be like to meet and interview people for this story, and had no idea how to prepare, so I went into it like I would any other story. But this wasn’t like any story I’ve ever covered. After asking this guy about his background, I found myself drawing a blank. I couldn’t think of what else to ask him, even though, on another level I had a million questions, and one major, impossible one which is…what is your life like? I settled on asking about what daily life is like at the orphanage instead. In retrospect, I should have also asked if there was enough food at the orphanage. It would have been good to get his perspective, because as I soon learned, there isn’t enough food and so much else besides. The orphanage looked clean and new on the outside, a testament to how well it was cared for. There was nice metal water pump on a concrete foundation, and in general it didn’t feel have the feel of squalor. But despite appearances, I was told there’s a major lack of infrastructure, schools, medical facilities and food in the area. This place, around the town of Grafton, used to be the site of a camp for internally displaced people during the war. I learned that the shacks not far away, which I’d glanced at without a second thought, were remnants of this camp. It was a reminder that so many places in Sierra Leone once saw the horrors of the civil war. It’s so strange how easy it is to forget this, and how normal things look now. After I’d interviewed everyone, the kids went back inside and the adults went about their business, and the driver and I waited a bit outside for the donor to arrive and the ceremony to commence. I stood under my umbrella as it drizzled on and off, and watched the thin dogs resting and looking for food. At one point Ms. Tucker hit a dog, that looked like it had just grown out of puppy-hood, with a sandal to shoo it away, and the dog cried and scampered. Despite the infinitely worse human story, it was easy to feel sorry for these dogs — one had an ear injury which flies buzzed around, and it looked constantly irritated and pained. But I realized Ms. Maragaret probably took pride in the orphanage. This was the only place for her and the children she had taken on, and so dogs like this were just a nuisance. It’s interesting that I’m culturally programmed to see dogs as adorable, but most people around the world aren’t. Eventually the donor Ibrahim, his wife and young daughter and son arrived. They were all dressed in shades of turquoise, presumably to match the daughter’s Elsa from Frozen costume, which was complete with tiara and wand. The father Ibrahim’s speech struck a similar tone. He also urged hard work, saying he achieved everything in his life this way, although of course God got some of the credit too. I don’t know this man’s background — maybe he worked his way up from nothing, maybe not. But it was troubling to see him basically presume that the orphans wouldn’t work hard. He did say, “You will be our next doctors, lawyers, politicians, presidents,” but overall it came across as a slightly tone-deaf “tough love” message. The daughter recited a rehearsed speech that the journalists present were later handed printed copies of. One line from it stood out: “I will always remember you.” I don’t want to criticize a ten year old kid, especially when she almost definitely didn’t write the speech, but it was clear there was no genuine interaction between her and the orphan kids. They lived in different worlds, she a middle class kid and they orphans of horrible circumstances, and it didn’t look like they said anything to each other. Again, I’m sure it’s totally normal 10-year-old behavior, but it was a good example of how the parents seemed to make the event more about their daughter than the children orphaned by Ebola and the civil war. But it struck me at the same time that the father seemed genuine in his desire to reach out to the disadvantaged. He made the point several times, in his speech and in interviews later, that more middle class Sierra Leoneans like him could and should chip in to help survivors of Ebola. They shouldn’t wait around for the government and NGOs to help when there’s so much they could do with just small donations. After all, his 20 bags of rice and cans of sardines was the biggest ever food donation this orphanage had ever received. And Margaret talked about having to beg in the streets at one point to feed the kids. (This was in her speech, given in Krio; I only picked up on it after Ibrahim mentioned it in an interview, and I listened back to my recording and sure enough that’s what she said — the gist of it was understandable). A few days later when I talked to my colleague about the event, she had a pretty cynical take on it. She was sure Ibrahim paid the journalists to cover it, and he only wanted me because he knew I wouldn’t ask for money. This was a bit of a blow to the ego of course, because I was still under the naive impression he’d wanted me to cover it because he liked my columns. But more importantly, if true (and I mean, because my colleague obviously understands her country far, far better than I do), it was pretty disappointing. Because as staged as the whole event was, I did sense some genuineness from Ibrahim. He seemed well-meaning. Covering this story was an experience I won’t forget. I saw more of the effects of Sierra Leone’s recent traumatic history than I ever had before before, and an interesting glimpse into class differences in Sierra Leonean society. I realized as I was writing the story that it was about a middle class African Muslim family, whose daughter likes to dress as Elsa from Frozen, donating to an orphanage and urging their fellow countrymen to do the same. Where does that fit into the conventional narratives and stereotypes about Africa, Islam or the developing world? It runs circles around the stereotypes. This is why I wanted to come here — to see what things were really like — and every day I’m seeing things that expand the possibilities in my own mind of what life in Africa is like. Here’s a link to my story if you’re curious. And you can donate to the orphanage here. They need all the help they can get; remember that their biggest ever food donation was 20 bags of rice, and the caretaker has had to beg in the streets to support the orphans there. Last week I visited the World Bank headquarters in downtown Freetown to cover a press conference. It turned out to be the announcement of a new electricity plant for Sierra Leone. This is a big deal for a country without a full electrical grid. The new plant will be a little bigger than the country’s main plant, which is located along a river and is unreliable. I also went to cover a ceremony for the donation of a shipping container full of medical supplies to the Freetown military hospital. It was interesting to get a glimpse of how development works here. At the World Bank press conference, World Bank Country Manager Parminder Brar said the new electric project would cost about $138 million US dollars. This is more than the World Bank’s budget for supporting agriculture, health and the social safety net in Sierra Leone, combined. Maybe it was a naive question, but I asked why the budget for this one electric project was more than these other sectors. He basically said that supporting electricity has to be a priority, because without it nothing else is possible. He also said that since basically everyone in Salone could benefit from help with the safety net, even if the whole World Bank’s budget for the country was dedicated to this, it would be a drop in the bucket. Again, it’s probably naive of me to not know that this is probably how a lot of aid works, but I was kind of surprised. It’s sobering. I wrote a story covering the press conference — or rather two stories, because my colleague said it should be split in half, partly because there was enough material for two stories, and partly because my draft was apparently too long for the paper. Definitely a different way of doing things than I’m used to. Anyway the first story I wrote focuses on the new electrical project and the second gives context for how much the World Bank has donated. On the next day, I think, I went to the 34 Military Hospital in western Freetown, where the US Embassy was donating two shipping containers full of $800,000 worth of various medical supplies. Several people gave speeches, including a Defense Attache from the US military. Apparently, this hospital had been chosen for the donation because of its good work in fighting Ebola. Here’s the brief story I wrote covering that ceremony. These donations and development aid projects raised a lot of questions for me. First of all, I wonder what it’s like for the national morale to live in a country so dependent on aid (or is that just a meaningless question? I don’t know). I also wonder about accountability with these large sums of money. And in the case of the US Embassy donation, I wonder why it seems like just a drop in the bucket. Donating almost a million dollars is great, and it seems to be in a form that would do a lot of good, but the types of supplies being donated were really basic — things that most any hospital in the US would have. It’s kind of weird seeing such triumphant ceremonies for drops in the bucket. It’s a stark a reminder of how underdeveloped Sierra Leone is. I guess this is all nothing remarkable in the world of development. It’s not a subject I paid a lot of attention to before, but it’s really interesting and obviously underlies so many other issues in Salone. I’ve written two columns sort of about the city. The first was responding to another Awoko columnist who advocates for clearing out the slums — in my column I compared this to the city of Seattle’s recent effort to clear out the Jungle of homeless dwellers. The next column is just about my experiences exploring the city — downtown, the western and eastern parts. Seattle, my hometown in the American state of Washington, has at least two major things in common with Freetown: a healthy amount of rain, and a large population of homeless people. Seattle and its surrounding County have such a problem with homelessness that it’s officially been ruled a “crisis.” Though many live in shelters or makeshift housing of some kind, it’s also quite common in Seattle to see homeless people in the streets, sleeping under doorways, begging, selling newspapers or playing music for money (and unfortunately, also the occasional alcohol or drug addict). In a column yesterday in Awoko, writer Beny Sam decried the over crowdedness of many parts of Freetown, the houses springing up in risky locations such as under bridges, the risks of disease in places like Kroo Bay and Bomeh. Sam blames Freetown’s overpopulation for the problem, but also NGOs and civil society organizations who oppose evicting people from their homes, and instead aim to help people where they are. “What these Bodies forgot was that the locations are not ideal and will never be,” he writes. Sam instead praises the “khaki boys” from the days of the National Provisional Ruling Council (NPRC) who evicted people living in “dangerous” places. I never know what I’ll find when I turn a corner in Freetown. It’s unlike any city I’ve been to, and I’ve unexpectedly stumbled on so many things just walking around. In fact, there are too many to list. The paved street outside my hostel turns into to a dirt road through a cluster of makeshift houses, making the city suddenly look rural. There’s the scene I saw near Siaka Stevens street: a woman hawking sandals, baskets of charcoal on piled up on the ground, and an elderly man sitting in a tiny shack, with the words “Expert clock repairer” in faded paint. Nearby, past fruit and cigarette sellers, is the CD market that intermittently blares Bollywood songs in the evenings, overlaying an Indian soundtrack on top of the West African street and its beeping horns. It’s hard for me to wrap my head around this city. The layout alone defies description. Just in the downtown area, crowded, slum-like areas made up of rusting tin roof houses fill out the city, adding bulk and masses of people to the old skeleton structure established long ago by its urban planners. 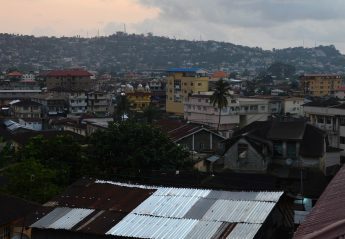 Some streets in downtown Freetown are laid out in a grid and lined with sturdier-built houses and buildings. They can look brand new, faded and decaying, stuck in the early stages of construction, and everywhere in between. And that’s just downtown.